The city-state of Ardica floats offshore from a continent-spanning necropolis, sacred ground no one is permitted to inhabit. Legally, Daria should register with the Ardican agency that monitors those with the ability to tap the energy left by the dead. But despite heavy-handed government measures, the threat of war beyond Ardica’s walls, a criminal gang’s machinations, and her own brother’s law-abiding ideals, independent-minded Daria is determined to hold onto her freedom. Even if it means starting a revolution. Graves is an action drama set in a techno-magical distant future. Updates are scheduled to post weekly on Monday. 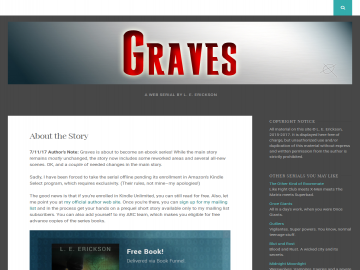 Please note: Graves contains some harsh language, sexual situations, and possibly graphic violence. Graves has not been reviewed yet. Graves has not been recommended yet.